FOXBOROUGH, Mass. – An AFC championship game rematch between Baltimore and New England wasn't even set before tough talk from the Ravens began. Baltimore linebacker Brendon Ayanbadejo took to Twitter in the first half of New England's divisional playoff game against the Houston Texans and started blasting the Patriots hurry-up offense as a gimmick and mocking the organization for the 2007 "SpyGate" scandal. "In a sport that is predicated on mano y mano, 'let's hurry-up n snap it' = bitchassness," Ayanbadejo tweeted. With New England eventually beating the Texans 41-28, the Patriots will host Baltimore next Sunday with a trip to the Super Bowl on the line again. Ayanbadejo's comments are the first shot in what could be a contentious week of trash talk between the two AFC rivals. New England edged Baltimore 23-20 in last year's AFC championship game, in part because the Ravens dropped a potential game-winning pass and missed a game-tying kick in the final seconds. 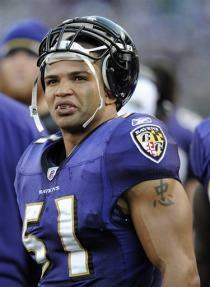 Ayanbadejo, after waves of negative reaction, backtracked from his comments on Monday, offering an apology via Twitter. "I made selfish comments on twitter last night that reflected poorly upon myself, my teammates, and the organization," he tweeted. "For that I apologize." The Patriots, famed for their focus, seemed unconcerned by the talk. "The best thing we do is ignore the noise," quarterback Tom Brady told WEEI on Monday. "Nothing anyone says is going to affect us next week." In the past, the Ravens players have been critical of New England, including Terrell Suggs pointing out that Brady pleads for calls with officials. In piecing together some previous tweets, Ayanbadejo took issue with New England's tendency to snap the ball quickly in an effort to get defenses off balance. The Patriots have run more offensive plays this season than any team in the league. New England scored an easy touchdown in the second quarter on an eight-yard Tom Brady to Shane Vereen pass in part because the Texans failed to line up properly before the quick hiking of the ball. "New England does some suspect stuff on offense," Ayanbadejo, a three-time Pro Bowler, said on Twitter. "Can't really respect it. Comparable to a cheap shot [before] a fight. "… the hurry snap offense catch [them before] they set up," Ayanbadejo continued. "It's a gimmick … Their offense is good enough to be successful without that." Ayanbadejo also questioned the class of the Patriots organization. "You know the same organization that did spygate and cut a guy the day [before] the Super Bowl," he said of receiver Tiquan Underwood, who was released the day before last year's Super Bowl to make room for a defensive end to be moved from the practice squad. The rivalry between the two franchises and teams is intense. That the trash talk began before the matchup was even set and New England was still locked in a close game with the Texans sort of says it all. Ayanbadejo even went to the ultimate Patriots taunt. • With Duke, Michigan losing and no unbeatens left, who's No. 1?